Aug. 24, 2016 Update Glad to hear Creative Galaxy will be back for season two starting Sept. 16, 2016 as I keep reading more research about the tactile, artistic, creative benefits of hands-on art at every age and want to ensure that in this era of screen time experiences, we don’t lose sight of the opportunity for OFF-line messy arts ed for growth, brain food and imagination. That said, this new KQED Mindshift post “How Integrating Physical Art Into Digital Creations Expands Creativity” made me think about my prior post on MIT’s I/O Brush and moreover, about how shows like Creative Galaxy could springboard into yet another dimension of play with green screens, storytelling and claymation much like the Children’s Creativity Museum morphing art, technology and education into hands-on learning and fun. So many opportunities for shows like this to thrive amidst the digital deluge…Congrats to Amazon Kids for keeping the cool content at the high bar for early childhood education…using the ‘and not or’ approach to what ‘screen time’ can mean. Original Post July 3, 2014 Lately, it feels like an entire generation of parents have opted away from messy, free form imagination stations towards “assembly” using pre-cut pieces and prompts to ‘create’ arts and crafts that end up with tidy take-homes of sameness a la catalogs and kits. From Lego’s licensed, branded, themed toys, to popular Creativity for Kids boxed kits in the arts and crafts toy aisles, we’re seeing more “pre-sets” and less building on brain plasticity. 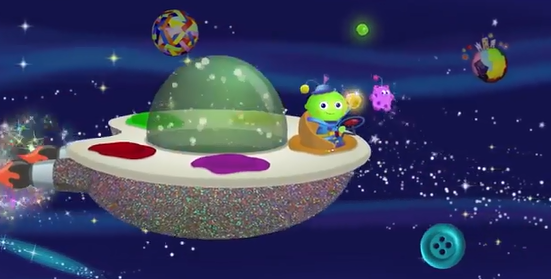 Amazon’s new Creative Galaxy original kids programming (episode 1 here) is trying to change some of that, providing a unique spin on the subject by starting with on-screen animated storytelling seguing to live-action arts and crafts with kids in maker mode extending their own ideas into play. They’re essentially using media as a play prompt for offline tactile exploration to reseed imagination and open-ended discovery…a brilliant “given” considering the arts cutbacks in school, and the benefits of art from a child development standpoint. The ‘value-add’ as they say in marketing, is that in my opinion, they’re addressing a huge need by tossing in “train the trainer” tips outreaching to a new generation of parents of 3-6 year olds who may NOT “do crafts” by guiding them through the simple joys and tactile triumphs of encouraging kids with messy, hands-on fun. Parents have been sold an implied NEED to be guided via pre-planned enrichment classes, creativity camps, boxed kits or even digital dance like the Wii challenges. So we’re really at a point of “counter-marketing” that concept to get back to free-form self expression. Granted, some of the pre-packaged dynamics are simply the pervasive productization and commodification of the arts, as parents turn to ‘grab-n-go’ processed pre-fab items, much like the food system’s pouch and tube offerings. Like whole foods in farmer’s markets vs ‘conveniences’ with all the additives, we need to encourage ‘the real deal’ to ensure we’re not leaving behind some of the unique self-expression that kids achieve with a smock, an easel, or ishy squishy finger painting in favor of ‘no fuss no muss’ canned entertainment or even techno-digital creative coolness like MIT Media Lab’s I/O brush. The thought of sensory, tactile fun being thrown under the bus with cutbacks and clean up concerns in pre-K environs to “confine the mess” is squirm-worthy, and if shows like Creative Galaxy can help “light up” experiential learning and get kids thinking out of the box(ed) kit, I’m 200% onboard! I strongly feel there’s too much emphasis on “proficiency vs play” these days (especially in “Title One” low income arenas where early learning veers toward pounding in core skill sets to read and write at increasingly younger ages) so it’s refreshing to see Creative Galaxy try to give a jumpstart to both, by painting a canvas of colorful animation with a “view and do” philosophy and a palette of art enrichment. As I wrote yesterday in part one, “Amazon Kids Shows Segue Screen Time Into View + Do,” it’s encouraging to see positive media like this come to life, as they’re strategically tasking themselves with fostering lifelong creative learning in fun fresh ways that schools are sorely lacking. Early Brain Development Specialist and owner of Brain Insights, Deborah McNelis’s post on developing children’s brainpower backs up the need for playful discovery in early childhood education, sharing some of what’s wrong with parents and educators’ thinking when it comes to “what works and what doesn’t”…mirroring the extensive research, purpose and intent of Creative Galaxy’s mission to have kids grasp concepts through play! In the final few minutes of each episode they segue to real life kids ready to rock their own art projects, in this case, using circular cotton ball dots, googly eyes, and free form play as the kids painted a pepperoni pizza with dots, cut up a slice and used pretend play to nosh, serve, and even feed it to the pom pom caterpillar. It’s not just arts and crafts prompts or an “art makes you smart” lens to remind that “creativity matters”…It’s a subtle mini-art education tidbit splashed into a kids’ cartoon landscape, similar to how health education can be embedded into TV shows for a greater good using well-researched media messages. “Will you help me make art? What would YOU make with dots?” Arty the artist asks, as the camera “lights up” the kids with the rainbow magic of colorful dot painting and zooms in and out for perspectives using the classic A Sunday Afternoon on the Island of La Grande Jatte by Seurat…They slipped in art history about the pointillism style within a show-n-tell context that makes sense. Cool. In the first episode it was all about visiting planet “Paintonia” and in episode two, they ventured to the planet “Buildera” to draw and build extending art into everyday observations within the world. By conveying the “art you can live in” message with shapes, sizes and spacial relations the show’s architecture theme put forth solid critical thinking. They themed the storyline around having kids help choose “Which house is best” to make a bunny a home big enough to fit its long ears inside the right-sized roof with plenty of space to hop around. They clearly constructed the bunny house with a few open doors to empathy and tugs on social emotional heartstrings (brrrr–wind chill, let’s keep the bunny warm) which builds on both the notion of collaborative play and task-driven goals, producing a wonderful sense of accomplishment with seamless, subtle learning. Yep, I’ll BET there’s a lot of research in this show. It’s definitely well thought out. My Favorite Creative Galaxy Take-Aways? Now, some specific show insights from Angela Santomero, the force field of Creative Galaxy, known for her award-winning early education kids shows like Blue’s Clues, Daniel Tiger’s Neighborhood and Super Why supported by educational psychologist Dr. Alice Wilder who provided me vital background, framing the vision and reasoning with her own children’s media prowess. Amy Jussel, Shaping Youth: It feels like you’re ‘teaching parents’ how to engage with kids creatively as much as teaching kids how to engage with art? How do subtle, purposeful cues carry forth when you’re developing plot points and storylines and how did you set out to embed these nuanced cues in kids media for positive intake? Angela Santomero, Creative Galaxy: First of all, I just love that you are the parent who will host arts and crafts for the entire neighborhood! Bravo! The time is now for us to harness the power of media to bring the arts to kids. 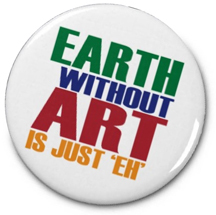 With so many schools cutting the arts from their curriculum; we need to showcase using art as a resource for life; using art to solve problems and how the maker movement is propelling kids into the future. We want our kids to be creative self-directed learns who innovate to change the world! We have a phenomenal research and development process where writers, exec producers and researchers work together to ensure that each episode hits all of plot points and storylines. Our goals include introducing kids to the masters with preschool art history points as well as some art vocabulary. In addition we hope to inspire kids to go and paint; draw; create. In order to do this we need to ground the curriculum in characters and a world that preschoolers can relate to. Arty is a creative preschooler who is consistently sparked with ideas. 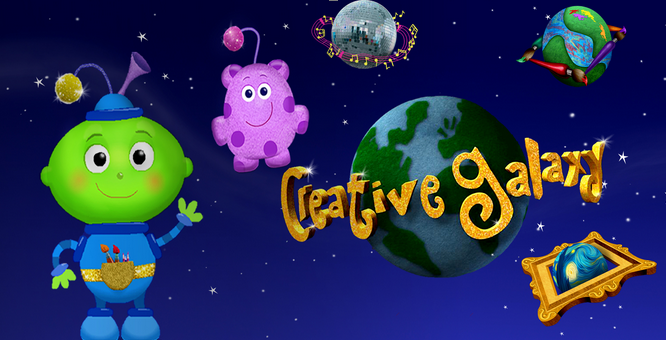 When faced with a preschool relatable problem, Arty soars through the creative galaxy to solve his problems with art. How he talks, how he interacts with the home viewer and his friends. Because of this, we can also incorporate social emotional storylines and other positive modeling. Angela Santomero, Creative Galaxy: As a media maker, I feel a giant responsibility to model good practices in all of my shows. No matter the curricular framework, we model all aspects of safety, eating good healthy foods and show positive ways to talk to one another. The shift from animation to live action interstitials is our desire to surround kids with our art messages and crafts. It was important to us and to Amazon to extend the learning of the show by seeing how real kids – all kids – can make and do the projects we feature. Amy Jussel, Shaping Youth: Are you purposely embedding subtle art education and ‘informal learning’ hidden within the script as an ongoing springboard of classic art/edu to supplement the cutbacks in school programs? Angela Santomero, Creative Galaxy: I believe, strongly, that when kids actually participate in anything they are learning more. So, for a media experience, we break the fourth wall so kids can be part of the action and propel the storyline forward. This also ensures that kids are not just absorbing our material but practicing by participating and making along with us. We love the idea of promoting pretend play and make believe in any way we can. With more and more time spent on tech, it is so important to show the fun and value in imagination, creativity and collecting ideas that spark you – you never know when you might use them! Amy Jussel, Shaping Youth: Can you explain why you’ve chosen to use the last 3minutes or so of each show to seed kids’ own creations in ‘real life vs animation?’ Is it for doability and seeding open-ended discovery? Angela Santomero, Creative Galaxy: We want to do both – open ended discovery and questions to the home viewer vis a vis Arty – as well as show real kids making real art. While we are inspired by the creativity and beauty of Pinterest boards, we also want to make sure that kids can be empowered by what they make and the ideas that they have. The whole point of creativity is to embrace one’s unique perspective . Being “perfect” and doing “cookie cutter” art would deviate from our purpose. Amy Jussel, Shaping Youth: As we say in scriptwriting, there are a lot of celebrity “attachments” to this show, doing voiceovers of the animation. (e.g. starpower like “Samantha Bee (The Daily Show), Christian Distefano, Jason Jones (The Daily Show), Cloris Leachman (Malcolm in the Middle), and Jason Priestley (Beverly Hills 90210)” Is this for the benefit of the parents or the kids? Curious. Angela Santomero, Creative Galaxy: Parents have been applauding and coming out to celebrate the arts! 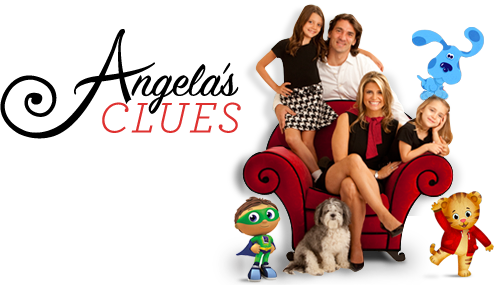 All of our celebrity voice over talent are parents (or Grandparents) and they were all excited to be part of the Creative Galaxy, so yes, there’s an element of bringing some of the star power to parents who will appreciate these talented fun actors. Amy Jussel, Shaping Youth: Even though the show is about hands-on creativity, you have a mobile app too. Could you give us some examples of why an app works differently than the show, and how parents/educators might use it for ideation or on the spot interaction with kids. I realize it’s not ‘either/or’ with creativity and digital offerings but hands-on self-expression is my touchpoint, is this just another distribution channel for art and the fun factor? Angela Santomero, Creative Galaxy: The Creative Galaxy app will gives kids another way to create and make along with the show. We want all kids to have the opportunity to be makers. We will also have “Craft Recipes” available for most of the projects we feature to ensure that kids and parents can make at home if they would like. We are finding, in all of our research, that kids are running to their kitchens to figure out how to make what they want to make after being inspired by the show! Amy Jussel, Shaping Youth: What are your top 5 favorite digital art apps/sites that inspire creativity w/open-ended fun ASIDE from the Creative Galaxy app? Amy Jussel, Shaping Youth: Finally, a business question: Will this show be ‘merchandised’ with play products for creative arts like PBS does with characters and goods these days? What is Amazon Prime revenue generator for sustainability of quality content beyond the subscription model? I notice for example, that Disney is doing a prosocial web show Citizen Kid using an exclusive sponsor…milk, to foot the bill. Amy Jussel, Shaping Youth: Thanks for your time, Angela. It’s smart to embed the learning right into the entertainment. Not chocolate covered broccoli by any means, but as an inspiring reminder of what we as parents do NOT want to fade out of view.